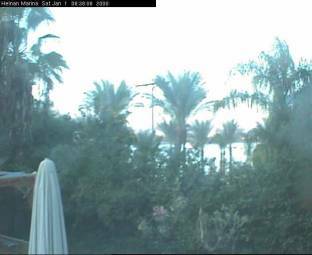 It's 13:16 in Sharm el-Sheikh, Egypt right now. View of the Red Sea Two images from the Diving-Center Werner Lau offer a nice view of the Red Sea at Sharm el-Sheikh (From 7 a.m. to 5 p.m. every 20 minutes a new image). Dahab: Live from Dahab, 46.6 miles away. Dahab: Kite Lagoon, 46.6 miles away. Hurghada: Beach of Hurghada, 51 miles away. Soma Bay: Seaview, 72 miles away. Soma Bay: Soma Bay Beach, 72 miles away. Costa Luminosa: View over the Bow, 122.4 miles away. Petra: The Treasury, 184.5 miles away. Petra: Visitor Center, 184.5 miles away.